Ever since I signed up for Facebook, I've been amazed by a few things. First, I'm amazed at just how many people from all of my different worlds, past and present, are a part of this silly networking site: high school, college, seminary, church colleagues, fellow bloggers, UCCers far and near, etc. Second, I've been amazed at how active they all are on this site. They didn't just sign up and then walk away, maybe checking in every week or month. No, people are on all the time writing notes to each other, playing with different applications, posting pictures, and on and on. I'm complicit in that: up until very recently, I was near-obsessed with a Facebook game called Mob Wars, where you build a mob, do jobs, fight other mobsters, put people on the hitlist. It was when I 1) worried about letting this go without checking it for too long, and 2) started getting people asking me to add them as "friends" just to make their mob bigger, that I decided I and many others were taking this way too seriously. Still, I enjoy catching up with friends whom I get to see once a year if I'm lucky, and many more even less than that. There's one application on this site, however, that has really caused me to think lately, that being "Causes." Here's the deal: You create or join a "Cause," which can be anything from AIDS to Darfur to any number of charities already established to keeping Christ in Christmas. You invite others to join to help raise awareness, and there's an option to donate money to the "Cause" as well. Perhaps not surprisingly, there are usually many more members than dollars donated. This has led me to think lately about how easy it is to pay lip-service to things I care about as opposed to actually helping, donating money or time or whatever else, to help these various "Causes." I can click a button on Facebook or join a mailing list or say that I support this or that cause in name or in theory, or I can really pledge money, keep up with what an organization is doing, support events, organize events, and recruit real people. In other words, I can say I support something or I can really support it. It used to be that I was more involved in various organizations. Most recently, I was very gung-ho about issues related to mental illness. I organized a few events my final year of seminary to raise awareness, but since I moved back to Ohio I simply haven't made the time to connect with local chapters of NAMI. That was four and a half years ago. I've helped get my church involved in different things, but on a personal level I haven't done much beyond buying fair trade coffee. Clicking on some Facebook "causes" may help temporarily dissuade my guilt, but it doesn't last for long. Maybe it has the same effect for others. Or maybe others believe it's enough. So maybe that needs to be a New Year's resolution for me. I've already sworn off joining "causes" on Facebook. It feels like window dressing to me. 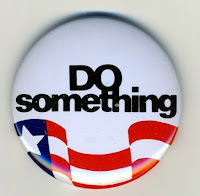 Time to do something differently, something that may actually matter.